Part 5 in a series of adventures seeking US coins in places where they are foreign. His goal: acquisition. His interests: coins from all over the world. His thesis: Coins should be sought where other collectors DARE NOT go. His weapons: numismatic knowledge, a smile, and a smattering of foreign words with which he attempts to form sentences. His schtick: He turns the noun "coin" into a gerund, "coining". He is: Mike Strub, traveling coin collector. I had been to Tokyo once before, but it was a 20-hour whirlwind of train rides, dinner, karaoke, and a quick snooze. Now I would have over a week. Are there any coin shops in Tokyo? Here might just be the ultimate challenge for me – figuring out how to buy coins in Japan! Internet searches for "coin" and "numismatics" in conjunction with "Japan" and "Tokyo" seemed only to turn up references to western sources who happened to have a few Asian coins. Then I happened upon the JNDA (Japan Numismatic Dealers Association) website! 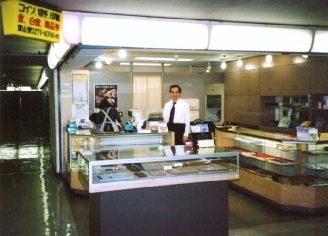 They provided specializations and addresses for eight dealers in Tokyo. A couple of the Tokyo dealers had websites – but on my screen they were illegible, with random punctuation and special characters. So I installed a patch to my web browser so it could display Japanese characters properly, and now it was still illegible for the right reason! Clicking their links at random, I found a few maps, but these were totally out-of-scale (I learned later.) I printed off some of them. Surely my good friend, Tanaka-san, would be able to help me make sense of it once I arrived in Japan? On the long flight – due to budget cutbacks, I flew in the "cattle" (economy) class. Thank goodness my boss wasn’t impacted by these cuts! I spent the time with my Japanese phrase book and taught myself to count in Japanese (itchi, ni, san…), including recognizing the number characters. I also threw in a few simple phrases like "Ohayo gozai-mass" (Good morning) and "Amerikan no dama ari-mass ka? (Do you have any American coins?). I was ready to strike out on my own in the big city! My hotel room was a highlight of my stay. Centered in my window, though 90 miles away, was the famous Mount Fuji. During the week of meetings that were my "real" purpose in being in Tokyo, a friend and colleague, Inagaki-san, brought an envelope containing all of his duplicate coins saved for the last 20 years. He had an eye for quality – all of the coins were AU or better. He had several 100 and 500 yen commemoratives he had received in change, plus a 1938 AU 1 Sen (that’s 1/100th of a Yen!) He would only accept approximately face value for these coins, which became the basis of my Japanese type collection. Also during breaks between meetings, Tanaka-san made a few phone calls to get specific directions to several of the shops. I carefully wrote down his instructions. Friday came – no meetings for me to attend – I sat down and neatly wrote out a full set of instructions for myself, including subway lines I would take and how many stations I would pass on each leg of my journey. 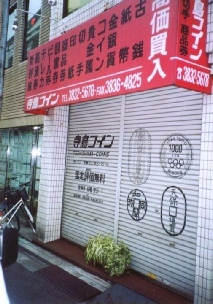 Located in the "Ginza 5" building, which of course comes after Ginza 3, 2, 1, and 4 in that order, I found this business with the help of 2 strangers and a picture from the Internet. There were many american coins – common, worn, and scratched $5 gold coins of 1910-1913 were 30,000 Yen ($255) apiece – no bargains here. Common BU 1921 Morgans, plus a number of cleaned Morgans of various common dates, were only 2500 Yen ($21) apiece, and common Peace dollars in similar conditions were 2000 Yen ($17). Common circulated walker halves were $8, and circulated 1964 Kennedies were $7. There was a book of 100 Yen coins in 2x2’s, and a similar book for 50, 10, 5, and 1 Yen coins. Although the 100 Yen coins were of the current designs, prices ranged from 300 to 800 Yen each. There was also a display showing how the Yen has been debased. The first Yen coins were gold – later they were large silver-dollar-size coins, followed by small silver coins, then – today – an aluminum coin worth less than a U.S. cent. I couldn’t read the Japanese captions to the display, but they all ended with an exclamation mark! I saw examples of the small rectangular gold-and-silver coins from the mid-1800’s and earlier, called "Bu" and "Shu", on display. I saw only one of the large sheet-like "Koban" and "Oban". There is a special set of challenges for westerners to find their way around Tokyo. First there are almost no street-signs, and no address numbers. To find an address, you are usually given directions like "exit subway at this-and-such stop. See Yamazaki convenience store. Walk 2-3 minutes. Then see cigarette shop followed by parking lot on right. 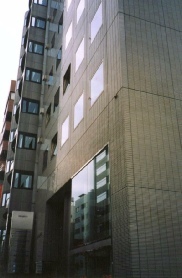 Then see Nishino Kinryo building." Oh – and you also can’t rely on map orientations being standard. They aren’t. The location of "North" could be in any direction compared to the map you are using. Japanese orient themselves by the names of their buildings and businesses. And, addresses are usually three-dimensional, as very many downtown restaurants, stores, and other businesses occupy only one or more floors of a multi-story building. Once there, you still have to figure out how far up or down to go. The directions to Taisei coins failed to indicate that the words "Nishino Kinryo" – the name of the building I was looking for – would appear in kanji characters – I hadn’t anticipated that, nor the absence of a sign with a coin on it. 90 minutes, 27 blocks, 5 strangers, 2 people phoned for help by those strangers, and a policeman later, I found that the building had been 4 buildings away from the subway stop, and even the local policeman on his beat hadn’t known it. 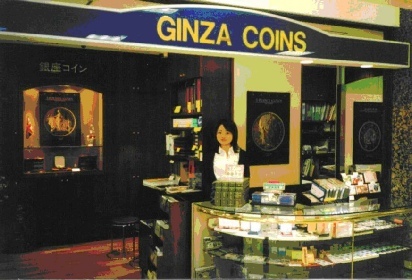 Oh – and Terashima coins doesn’t sell "old" coins. It isn’t a coin shop. It is a giant wholesaler of modern bullion products of Canada, Mexico, and etc. They gave me a photocopy of the unintelligible business cards of 7 coin companies that might be able to help. Maybe I’ll decipher them on my next trip. This next photo is of their non-descript building – no wonder I passed it 5 times! Another 2 hours of similar complexities – I wore through the inner lining of my shoe and had to simply remove and discard it - and I finally found the third coin shop. It was about 4pm, and the disinterest of the owner and his two assistants seemed rude until I realized that I was hindering their attempts to close up shop for the day. I bought a coin – a large European crown - that was only a little over retail, in order to show that I was a real customer and not just a browser. But Mr. Aida, the owner, only wanted to show me his Bu and Shu coins – and he eventually found a way to tell me to come again next week. I snapped a picture of him in his shop, of which he seemed quite proud. It was beginning to look like my numismatic adventure was going to be a bust. Upon my return to the hotel, a group of my friends, led by Tanaka-san, encouraged me to accompany them to "The Budweiser Bar". Shapely young ladies in form-fitting tights served us a great variety of dinner foods and beverages: tofu with fish flakes, raw chopped squid with wasabi, etc. In a ceremony, two waitresses sang a little song and cracked a hard-boiled egg on the forehead of one of my friends. I don’t know why they did this, but it was fun to watch. Before the two Karaoke bars we went to later in the evening, Tanaka-san sweet-talked the cashier into letting me – believe it or not – go through the entire cash drawer and fish out all of the "uncirculated" coinage I could find. The brass 5 Yen, which is considered by the Japanese to be good luck, is very pretty in uncirculated condition – they call it the "go’en" (go means five). I got plenty of these, plus one or more nice BU or Prooflike examples of each other circulating denomination. The next day, Saturday, was my last day for tourism before a Sunday return flight. I made an attempt to visit two more shops; one was open – the "Kennedy Stamp Club". Yes, the name wasn’t promising, but no other shop was reasonably close enough. For the first time, I came out of the right subway stop, turned to my right, and - Ta-Da! There it was! And it was open! I went up the stairs, turned right, and saw a woman behind a very small counter. Yes, she seemed to be a vendor mainly of stamps, but she had several trays of coins. I asked her to see the coins and pointed at them. She wagged her head "No" – this was not happening! She spoke no English, at all. I motioned to the tray of priced coins in 2x2’s and asked her to let me see them, but she seemed unable to comply. I flashed some paper money at her, then pointed again to the trays. Again, she didn’t respond. I got out my Japanese phrase book and cobbled together another request. Then she got a brilliant idea. She called a bilingual friend, who acted as our translator. Through him, she conveyed to me that the coin dealer was away for the weekend, she was just the stamp dealer, and could I come back on Monday? Undaunted, but unburdened with coin bargains, I took the subway back. There would be other countries to visit, other coins to buy, other narratives to write. If that plane left the ground Sunday and I wasn’t on it, I’d regret it. Maybe not today, maybe not tomorrow, but soon, and for the rest of my life. I’d always have Paris, and Stuttgart, and Stockholm.